This entry was posted in News and tagged Lane Cove on August 31, 2017 by skiffed_2. 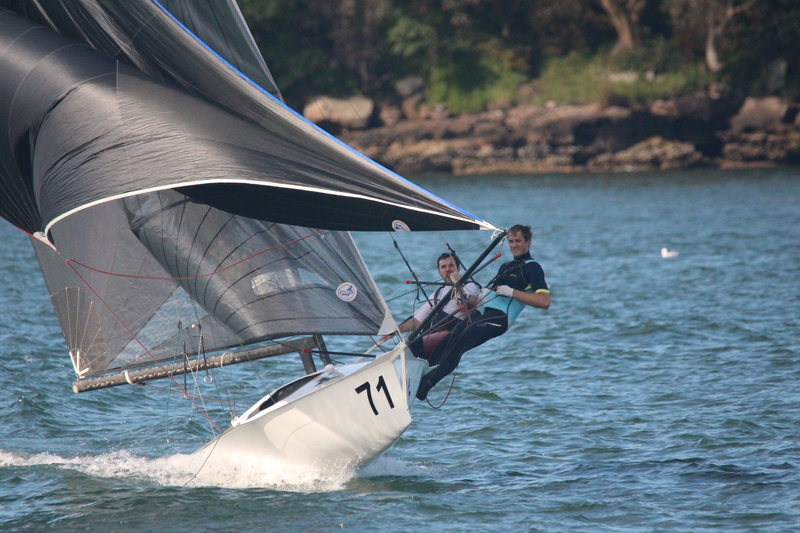 Nick Press and Andrew Hay convincingly won the Upper Harbour championship at the weekend. The 12’s were faced with a very tough day, with the southerly gusting to 30 knots. 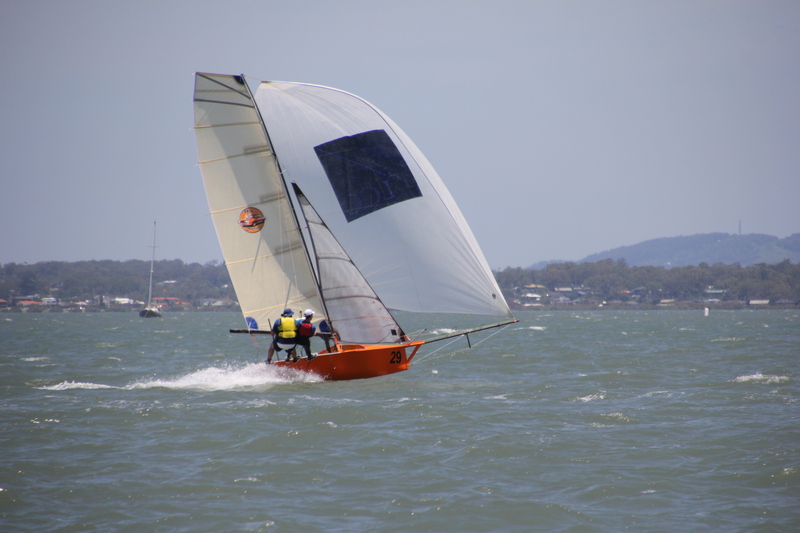 The alternate course was used due to a shipping movement, which took the skiffs down to Tarban Creek, adding to the already tough conditions. Press and Hay were never challenged and won start to finish. Brett Hobson and Billy Lusty aboard Geotherm finished 2nd, and were forced to work their way through the fleet after a pre start capsize. 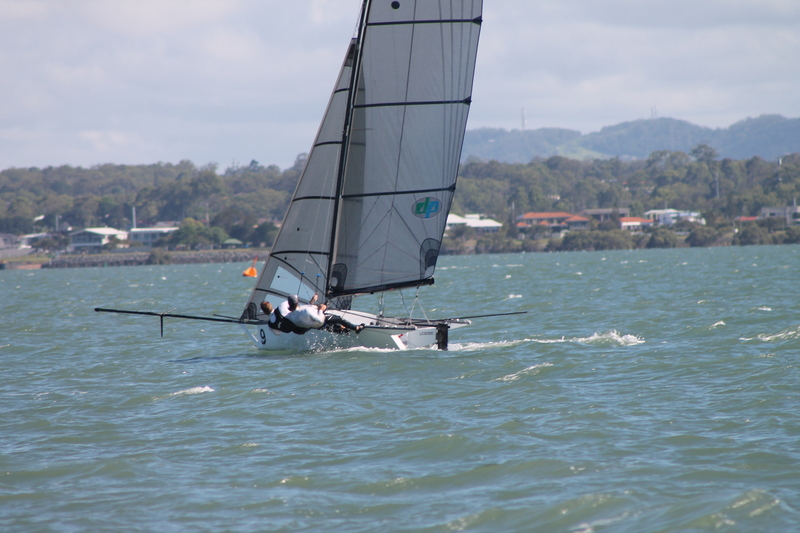 Fast finishing Skoll (Peter Polec and Mark Muirhead) were 3rd, who also worked their way through the fleet. Murray Press and Scott Lanham rounded out the top 4, after being in the hunt for 2nd for much of the day. 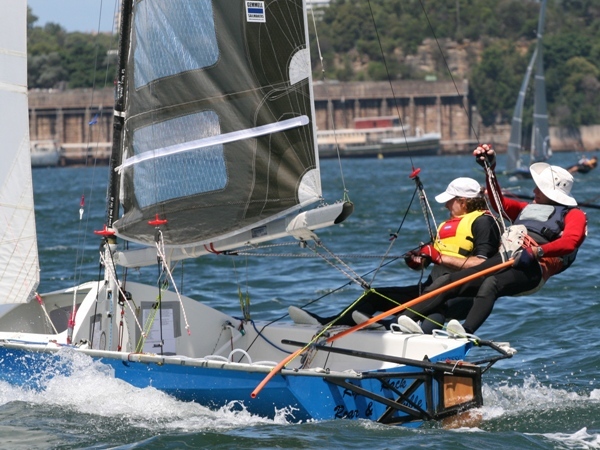 This entry was posted in News, Race Reports and tagged Lane Cove on October 11, 2016 by Skiff-Ed. This entry was posted in News and tagged Lane Cove on October 4, 2016 by Skiff-Ed. With a forecast building nor’easter, all bar a few skiffs elected for the 3rd rigs. It would turn out the right call as the breeze got in and was gusty, reminiscent of a few heats of the interdominions 2 years ago at Lane Cove. Right from the start two skiff in Gemmell Sails (Murray Press with stand in crew, and son, Nick) and Geotherm (Scott Hobson and Mitch Deane) got a small jump on the fleet. Lincoln Crowne (Jono Temple and Richard Jones) and Variety (Adam Forbes and Richard Johns) not far behind them, the former skiff lagging slightly after an altercation with Garde (Brett Hobson and Brad Phillips) soon after the start. The rest of the pack were all mixed together heading down the river, consisting of Vantage Real Estate (Brett Phillips and Jack Winning), Hey Charger (Nick Bernard and Robbie Polec) and Vintage (Cam Gundy and Cam McDonald). Once out of the river, Gemmell and Geotherm extended their lead on the fleet. 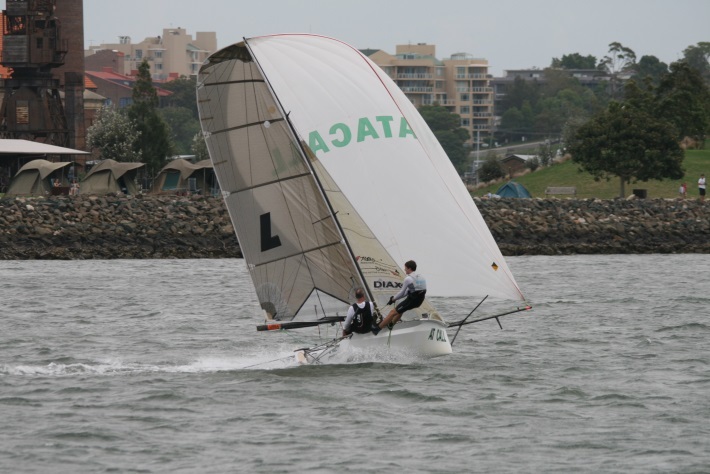 Vantage Real Estate had an early capsize on a strong gust, Vintage and Garde gained on Variety after they were forced to drop their kite to round Clarkes point. At the bottom mark, the top three remained unchanged, Gemmell, Geotherm and LCC, and Garde getting past Variety. By the top mark at Manns Point, Gemmell still held the lead, but LCC had now overtaken Geotherm, Garde holding 4th. Down to the bottom mark again, and Garde overtakes Geotherm. The breeze starting to get very wind at times and many skiffs retiring due to damage. Vantage with a broken rudder fitting and Hey Charge breaking a mast in 4 places and current 5th place Variety also retiring. The next leg of the race was a hairy two sail across Cockatoo Island from Valentia Street Wharf to Cove Street. Garde had just got by LCC, both skiffs electing to use their spinnakers early on to gain some time on Gemmell. Both were forced to pull the spinnakers back down again to pass the island. The top 4 positions remained the same for the next lap. Arrogant Frog (Peter and Steve Hill) and Madonna (Dave Winning and Pete Bevis) where making there way through the fleet, and damage boats, after both having bad starts. Now holding positions 5th and 6th respectively. Garde gained more time on Gemmell on the next downwind, bring more breeze with them that Gemmell missed. Up the next work, Garde overtook Gemmell and held a lead at the final top mark. The breeze continued to freshen and clock to the North. This forced Garde to down spinnaker around Cockatoo island, Gemmell were able to hold, pass Garde and again lead the fleet. LCC were a comfortable 3rd, 3min back, and Geotherm a few minutes further back in 4th. Gemmell led Garde back into the river for the finish, only 10 seconds separating the two. A thrilling finish was on the cards until a rushed tack on board Gemmell caused a capsize, handing the victory to Garde. This entry was posted in Race Reports and tagged 2012 States, Lane Cove on December 8, 2012 by Karmen. 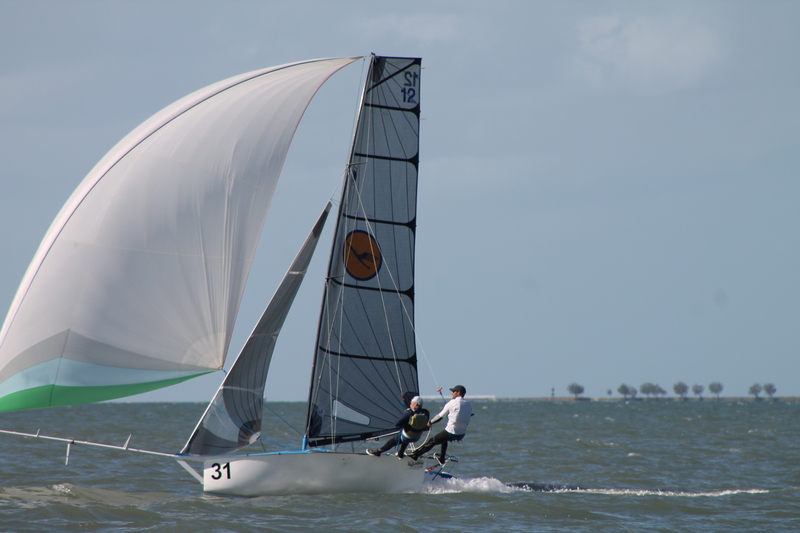 First inter-club race of the 2012-13 season, light easterly breeze forecast to strengthen & turn to the North-East, saw the fleet pondering the big-rigs, but leaning to the conservative option of the second rig: a choice virtually the whole fleet followed. 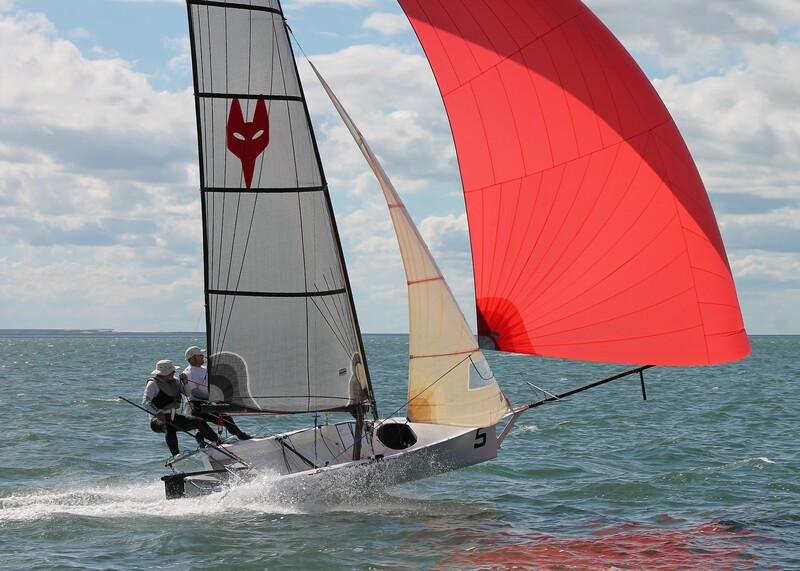 The Upper Harbour Championship also marked the launch day for the newly sponsored Variety sponsored skiff, and the first coming together of the whole fleet of 12‘s, so a race to look forward to. As well, famous offshore navigator Adrienne Cahalan making her return to the class that initiated her sailing career, stepping in as guest skipper on Hood. 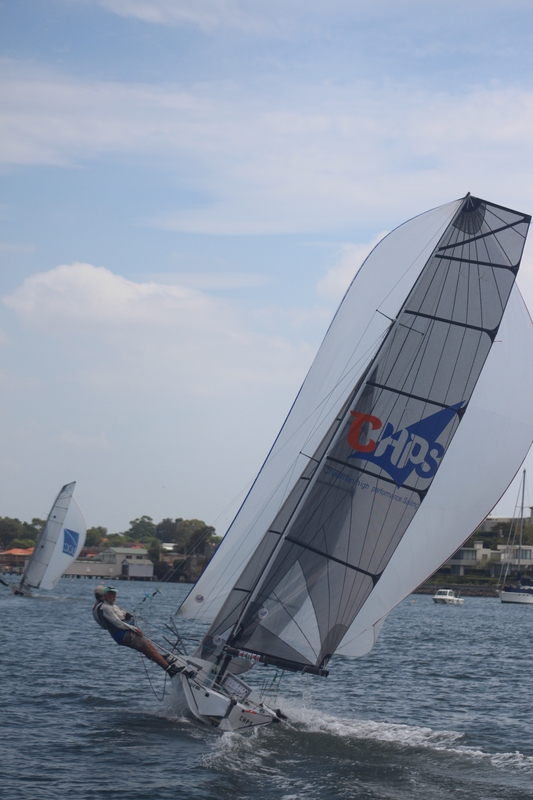 Light wind at the start, with a run-out tide, start-line tight to cross on starboard. No-one was brave enough to chance a port tack. This saw Gemmell Sails, Garde (with guest crew Nick Press, making a skipper/crew combination of multiple interdominion winners) and Lincoln Crowne & Co. off the line well & just ahead of the main fleet. A tight work out of the river, looking for puffs of wind, the new Variety skiff working into the lead bunch. At the notorious Humbug, beginning the tricky spinnaker ride into the Parramatta River, it was Garde with a small gap to Gemmell Sails then Lincoln Crowne & Co. and Variety, who discovered problems with their new carbon rigging & subsequently having to withdraw. This was the order on the work to Manns Point, & the start of the long & difficult run to Drummoyne, through the reach along Cockatoo Island and the spectator mayhem of the Red Bull circus on the island. On this run Garde made its first break on the fleet, getting through the traffic better than the following skiffs. Gemmell Sails also slightly gapped Lincoln Crowne on the run, with LCC closing the gap again at the bottom mark. The older skiff, Rip Rack Roar and Rumble, who was the only boat to choose big-rig, were making a fantastic showing at the upper end of the fleet at this stage of the race. Working back up to Manns point, chasing the now extending Garde, Gemmell Sails second, Lincoln Crowne & Co. 3rd with a slight gap to Geotherm in 4th. The breeze was freshening & getting gusty, making the second rig choice clearly the correct option. A tight spinnaker reach from Manns Point to the Valentia Street gybe mark in the increasing breeze saw the skiffs unable to reach the mark under spinnaker, having to drop and 2-sail to the mark: Gemmell Sails capsizing in this manouver, allowing Lincoln Crowne & Co. through to second, following Garde around the gybe mark, dodging the Red Bull traffic and re-setting the spinnaker for the remainder of the run to Spectacle Island. 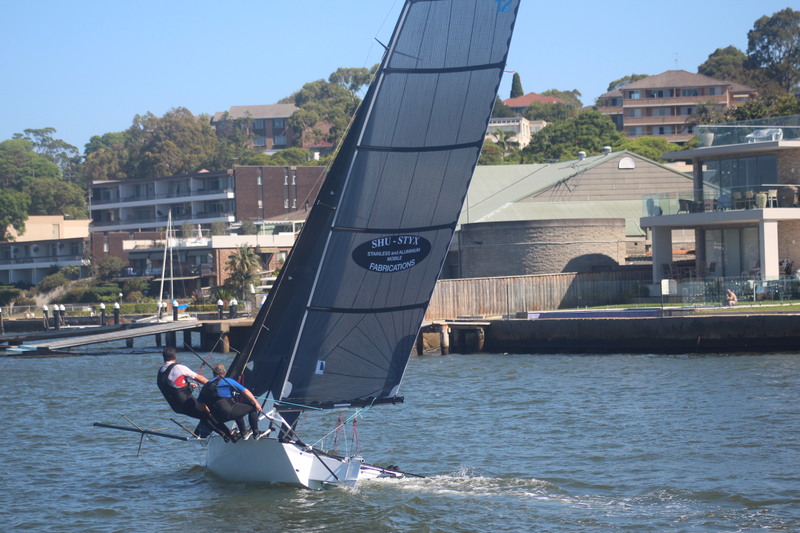 Long work back to Manns Point, Garde well ahead, Lincoln Crowne just holding out Gemmell Sails and Geotherm, around Manns Point then a tight, very windy spinnaker ride to the last mark at Birchgrove, with a 2 -sail into the Lane Cove River to head for the finish. At Valentia Street the spinnaker on Lincoln Crowne washed out of the kite bin & into the water, dragging the skiff to a halt, allowing Gemmell Sails to pull ahead by 40m. This was the finishing order, Garde a commanding win, Gemmell Sails & then Lincoln Crowne a further minute back, with a long gap to the 4th placed Arrogant Frog (Peter and Steve Hill). 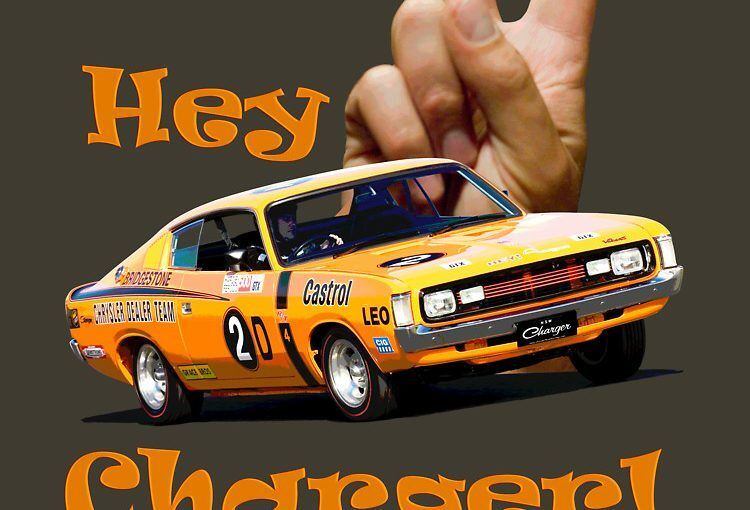 This entry was posted in Race Reports and tagged Lane Cove on October 6, 2012 by Karmen. 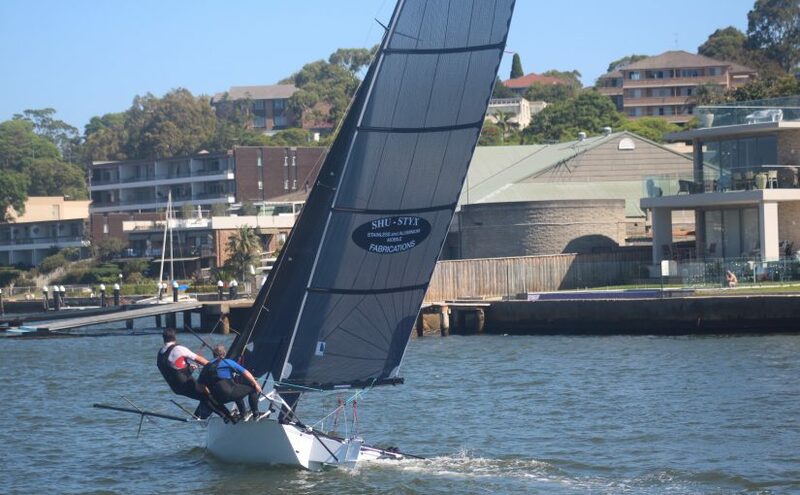 Gemmell Sails, skippered by Murray Press and guest crewed by Cameron McDonald, won the Upper Harbour Championship at the weekend, held at Lane Cove 12ft Skiff Club. Gemmell Sails took to the lead soon after the start and kept their nose in front all the way to the finish, despite close challenges from multiple skiffs, in a light and shifty south easterly breeze. All skiffs went with the big rig option with not a lot of breeze forecast. While Gemmell Sails jumped to the lead, there was a tussle for the minor places throughout the race, initially lead by Maersk Line and Garde, followed up by Linclon Crowne and Dimension Polyant. Garde had a capsize at the bottom mark to loose touch with the leaders. Gemmell Sails continued to lead whilst Lincoln, Maersk and Dimension traded places right up to the entrance to the river for the finish. With anything possible between there and the finish, Gemmell Sails held their nerve to take the win, while Garde caught the gust of the day to be back neck and neck with the others in 2nd place. Their luck continued and carried them through the narrows of the river to steel 2nd place. Dimension picked up 3rd, with Maersk 4th. Gemmell Sails also picked up the handicap for their stellar effort, with Maersk Line getting 2nd and Vantage Real Estate 3rd. This entry was posted in Race Reports and tagged Lane Cove on October 8, 2011 by Karmen.